Maternity clothes? Maternity jeans every day, maternity tops sometmes. I bought quite a few regular tops in a larger size from the Gap and these have been awesome. Sleep? No naps this week, I feel like I have my energy back. Best moment this week? Feeling baby move around a lot today, lots of flutters! Movement? Yup, lots of flutters today. What I miss? Caesar salad...almost everywhere has dressing with raw eggs in it, I never knew! 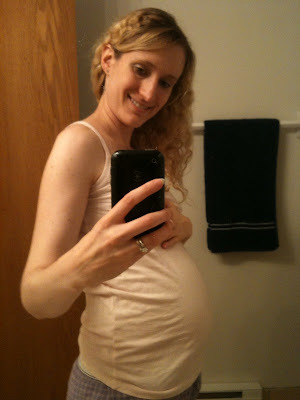 Milestones: I'm almost 4 months pregnant! Sorry about the raw eggs in caesar salad dressing. That's a bummer. It's one of my favorite restaurant foods. YAY! Love your cute bump M! And so cute about the flutters! Looking good mama! Look at that bump!! You are gonna be my confidante if and when I'm every blessed! I am so jealous of how adorable you are pregnant! Your baby is waaaay cuter than that ticker thing. Just sayin'. 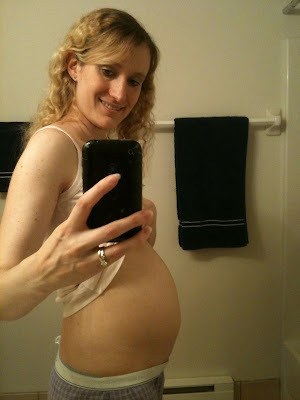 I am so jealous of your adorable baby bump!! Oh, and I totally didn't know about the raw eggs in Caesar dressing either! I was so upset when I found out. Boooo. Moochie, I freaking love your baby bump! You are so friggin cute!